Cyprian was a philosopher and renowned sorcerer originating from Carthage who lived in Antioch of Pisidia during the reign of Decius (249-251 AD). Springing from impious parents, in his very childhood he was dedicated by them to the service of the pagan god Apollo. At the age of seven he was given over to magicians for the study of sorcery and demonic wisdom. At the age of ten he was sent by his parents, as a preparation for a sorcerer's career, to Mount Olympus, which the pagans called the dwelling of the gods. Here there were a numerous multitude of idols, in which demons dwelled. "Believe me", he said, "I have seen the prince of darkness himself, for I propitiated him by sacrifices. I greeted him and spoke with him and his ancients; he liked me, praised my understanding, and before everyone said, 'Here is a new Jambres, always ready for obedience and worthy of communion with us!' And he promised to make me a prince after my departure from the body, and for the course of earthy life to help me in everything. And he gave me a legion of demons to serve me. When I departed from him, he addressed me with these words: 'Take courage, fervent Cyprian; arise and accompany me; let all the demonic ancients marvel at you.' Consequently, all of his princes also were attentive to me, seeing the honour shown to me. The outward appearance of the prince of darkness was like a flower. His head was crowned by a crown (not an actual, but a phantom one) made of gold and brilliant stones, as a result of which the whole space around him was illuminated; and his clothing was astonishing. When he would turn to one or the other side, that whole place would tremble; a multitude of evil spirits of various degrees stood obediently at his throne. I gave myself over entirely into his service at that time, obeying his every command". Thus did St. Cyprian relate of himself after his conversion. There lived at that time in Antioch a certain maiden whose name was Justina. She came from pagan parents; her father was a priest of the idols, Aedesios by name, and her mother was called Cledonia. Once, sitting at the window of her house, this maiden, who had then already reached womanhood, by chance heard the words of salvation out of the mouth of a Deacon who was passing by, whose name was Praylios. He spoke of our Lord Jesus Christ's becoming man, that He had been born of the Most Pure Virgin, and, having performed many miracles, had deigned to suffer for the sake of our salvation, had risen from the dead with glory, ascended into the heavens, and sits at the right hand of the Father and reigns eternally. This preaching of the Deacon fell on good soil, into the heart of Justina, and began quickly to bring forth fruit, uprooting in her the thorns of unbelief. Justina wished to be instructed in the Faith by this Deacon better and more completely, but she did not dare seek him out, being restrained by a maiden's modesty. However, she secretly went to the Church of Christ, and often hearing the Word of God, with the Holy Spirit acting in her heart, she came to believe in Christ. Soon she convinced her mother of this also, and then brought to the Faith her aged father as well. Seeing the understanding of his daughter and hearing her wise words, Aedesios reflected within himself thus: "The idols are made by the hands of men and have neither soul nor breath, and therefore how can they be gods?" While he was reflecting on this, once at night he saw during his sleep, by divine consent, a wondrous vision: he saw a great multitude of light-bearing Angels, and in their midst was the Saviour of the world, Christ, Who said to him, "Come to Me, and I will give you the Kingdom of Heaven". When Aedesios had become strengthened in the Faith of Christ, the Bishop, seeing his piety, made him a Presbyter (Priest). After this, having lived virtuously and in the fear of God for a year and six months, Aedesios in holy faith came to the end of his life. As for Justina, she valiantly struggled in the keeping of the Lord's commandments, and having come to love her Bridegroom Christ, she served Him with fervent prayers, in virginity and chastity, in fasting and great abstinence. But the enemy, the hater of the human race, seeing such a life, envied her virtues and began to do harm to her, causing various misfortunes and sorrows. She, however, replied to him, "My Bridegroom is Christ; Him I serve, and for His sake I preserve my purity. He preserves both my soul and my body from every defilement". Hearing such a reply from the chaste maiden, Aglaias, being instigated by the devil, became yet more inflamed with passion. Not being able to deceive her, he intended to seize her by force. Having gathered to his aid some foolish youths like himself, he waylaid the maiden in the path along which she usually walked to Church for prayer; there he met her, and, seizing her, began dragging her by force to his house. But she began loudly to scream, beat him in the face, and spat on him. The neighbours, hearing her wails, ran out of their houses and took the immaculate lamb, St. Justina, from the hands of the impious youth as from the jaws of a wolf. The disorderly youths scattered, and Aglaias returned with shame to his house. Not knowing what more to do, he decided, with the increase of impure lust in him, upon a new evil deed: he went to the great sorcerer and magician Cyprian, the priest of the idols, and having informed him of his sorrow, begged his help, promising to give him much gold and silver. Having heard out Aglaias, Cyprian comforted him, promising to fulfil his desire. "I will so manage", he said, "that the maiden herself will seek your love and will feel passion for you even stronger than that which you have for her". Having thus consoled the youth, Cyprian let him go, full of hope. Then, taking the books of his secret art, he invoked one of the impious spirits who, he was sure, could inflame the heart of Justina with passion for this youth. The demon willingly promised to fulfil this and proudly said, "This deed is not difficult for me, because many times I have shaken cities, crumbled walls, destroyed houses, caused the shedding of blood and patricide, instilled hatred and great anger between brothers and spouses, and have brought to sin many who have given a vow of virginity. In people who have settled in mountains and were accustomed to strict fasting and have never even thought about the flesh, I have instilled adulterous lust and instructed them to serve fleshly passions; people who have repented and turned away from sin, I have converted back to evil deeds; many chaste people I have thrown into fornication. Will I really be unable to incline this maiden to the love of Aglaias? Indeed, why do I speak? I will swiftly show my powers in very deed. Take this powder" (here he gave him a vessel full of something) "and give it to this youth; let him sprinkle the house of Justina with it, and you will see what I have said will come to pass". "O Lord, my God, Jesus Christ! Behold how many enemies have risen up against me and have prepared a net in order to catch me and take away my soul. But I have remembered Thy Name in the night and have rejoiced, and now when they are close about me I hasten to Thee and have hope that mine enemy will not triumph over me. For Thou knowest, O Lord my God, that I, Thy slave, have preserved for Thee the purity of my body and have entrusted my soul to Thee. Preserve Thy sheep, O Good Shepherd; do not give it over to be eaten by the beast who seeks to devour me; grant me victory over the evil desire of my flesh". Having prayed long and fervently, the holy virgin put the enemy to shame. Being conquered by her prayer, he fled from her with shame, and again there came a calm in Justina's body and heart; the flame of desire was quenched, the battle glorified God and sang a song of victory. The demon, on the other hand, returned to Cyprian with the sad news that he had accomplished nothing. Cyprian asked him why he had not been able to conquer the maiden. The demon, even against his will, revealed the truth: "I could not conquer her because I saw on her a certain sign of which I was afraid". Justina replied that the reward for those who live in chastity is great and beyond words, and that it is very remarkable that people do not in the least concern themselves for such a great treasure as Angelic purity. Then the devil, revealing his shamelessness, began with cunning words to tempt her, saying, "But then how could the world exist? How would people be born? After all, if Eve had preserved her purity, how would the human race have increased? In truth marriage is a good thing, being established by God Himself; the Sacred Scriptures also praise it, saying, Let marriage be had in honour among all, and the bed undefiled. And many Saints of God also - did they not enter into marriage, which God gave them as a consolation, so that they might rejoice in their children and praise God?" In great disturbance, the proud prince of the demons returned to Cyprian, who, finding out that he had not managed to do anything, said to him, "Can it be that even you, a prince powerful and more skilful than others in such matters, could not conquer the maiden? Who then among you can do anything with this unconquerable maiden's heart? Tell me by what weapon she battles with you, and how she makes powerless your mighty power?" Being conquered by the power of God, the devil unwillingly acknowledged, "We cannot behold the sign of the Cross, but flee from it, because it scorches us like fire and banishes us far away". Cyprian became angry at the devil because he had put him to shame, and reproaching the demon, he said, "Such is your power that even a weak virgin conquers you!" Then the devil, desiring to console Cyprian, attempted yet another undertaking: he took on the form of Justina and went to Aglaias with the hope that, having taken him for the real Justina, the youth might satisfy his desire, and thus neither the weakness of the demons be revealed, nor would Cyprian be put to shame. And behold, when the demon went to Aglaias in the form of Justina, the youth leaped up in unspeakable joy, ran to the false maiden, embraced her and began kissing her, saying, "How good it is that you have come to me, fair Justina!" But no sooner had the youth pronounced the word "Justina" than the demon immediately disappeared, being unable to bear even the name of Justina. The youth became greatly afraid and, running to Cyprian, told him what had happened. Then Cyprian by his sorcery gave him the form of a bird, and, having enabled him to fly in the air, he sent him to the house of Justina, advising him to fly into her room through the window. Being carried by a demon in the air, Aglaias flew on the roof. Seeing her, the demon left Aglaias and fled. At the same time, the phantom appearance of Aglaias, also vanished, and the youth, falling down, was all but dashed to pieces. He grasped the edge of the roof with his hands and, holding on to it, hung there; and if he had not been let down to the ground by the prayer of St. Justina, the impious one would have fallen down and been killed. Thus, having achieved nothing, the youth returned to Cyprian and told him of his woe. Seeing himself put to shame, Cyprian was greatly grieved and thought himself of going to Justina, trusting in the power of his sorcery. He turned himself into a woman and into a bird, but he did not manage to reach as far as the door of the house of Justina before his false appearances disappeared, and he returned with sorrow. After this, Cyprian began to gain revenge for his shame, and by his sorcery he brought diverse misfortunes on the house of Justina and on the house of all her relatives, neighbours, and friends, as once the devil had done to Holy Righteous Job. He killed their animals, he struck down their slaves with plagues, and in this way he brought them to extreme grief. Finally, he struck with illness Justina herself, so that she lay in bed and her mother wept over her. Justina, however, comforted her mother with the words of the Holy Prophet-King David: "I shall not die, but live, and I shall tell of the works of the Lord". Not only on Justina and her relatives, but also on the whole city, by God's allowance, did Cyprian bring misfortune as a result of his untameable rage and his great shame. Plagues appeared in the animals and various diseases among men; and the rumour spread, through the activity of the demons, that the great sorcerer Cyprian was punishing the city for Justina's opposition to him. Then the most honourable citizens went to Justina and with anger tried to persuade her not to grieve Cyprian any longer, and to become the wife of Aglaias, in order to escape yet greater misfortunes for the whole city because of her. But she calmed them by saying that soon all the misfortunes which had been brought about with the help of Cyprian's demons would cease. And so it happened. When St. Justina prayed fervently to God, immediately all the demonic attacks ceased; all were healed from the plagues and recovered from their diseases. When such a change occurred, the people glorified Christ and mocked Cyprian and his sorcerer's cunning, so that from shame he could not show himself among men and he avoided meeting even friends. Having become convinced that nothing could conquer the power of the sign of the Cross and the Name of Christ, Cyprian came to his senses and said to the devil, "O destroyer and deceiver of all, source of every impurity and defilement! Now I have discovered your infirmity. For if you feel even the shadow of the Cross and tremble at the Name of Christ, then what will you do when Christ Himself comes to you? If you cannot conquer those who sign themselves with the sign of the Cross, then whom will you tear away from the hands of Christ? How I have understood what a non-entity you are; you are not even able to take revenge! Listening to you, I, a wretched one, have been deceived, and I believed your tricks. Depart from me, accursed one, depart! For I must entreat the Christians that they might have mercy on me. I must appeal to pious people, that they might deliver me from perdition and be concerned over my salvation. Depart, depart from me, lawless one, enemy of truth, adversary and hater of every good thing!" Having heard this, the devil threw himself on Cyprian in order to kill him; attacking him, he began to beat and strangle him. Finding no defence anywhere, and not knowing how to help himself and be delivered from the fierce hands of the demon, Cyprian, already scarcely alive, remembered the sign of the Cross, by the power of which Justina had opposed all the demons' power, and he cried out: "O God of Justina, help me!" Then, raising his hand, he made the sign of the Cross, and the devil immediately leaped away from him like an arrow shot from a bow. Gaining courage, Cyprian became bolder, and calling on the Name of Christ, he signed himself with the sign of the Cross and stubbornly opposed the demon, cursing and reproaching him. As for the devil, standing far away from him and not daring to draw near to him out of fear of the sign of the Cross and the Name of Christ, he threatened Cyprian in every manner, saying, "Christ will not deliver you out of my hands!" Then, after long and fierce attacks on Cyprian, the demon roared like a lion and went away. Cyprian then took all his books of magic and went to the Christian Bishop Anthimos. Falling to the feet of the Bishop, he entreated him to have mercy on him and to give him Holy Baptism. Knowing that Cyprian was a great sorcerer, feared by all, the Bishop thought that he had come to him with some kind of trick, and therefore he refused him, saying, "You do much evil among the pagans; leave the Christians in peace, lest you speedily perish". Then Cyprian with tears confessed everything to the Bishop and gave him his books to be burned. Seeing his humility, the Bishop instructed him and taught him the Holy Faith, and then commanded him to prepare for Baptism; and his books he burned before all the believing citizens. Leaving the Bishop with a contrite heart, Cyprian wept over his sins, sprinkled ashes on his head, and sincerely repented, calling out to the True God for the cleansing of his iniquities. Coming the next day to Church, he heard the Word of God with joyful emotion, standing among the believers. And when the Deacon commanded the catechumens to go out, declaring, "Ye catechumens depart", and certain ones were already going out, Cyprian did not wish to go out, saying to the Deacon, "I am a slave of Christ; do not chase me out of here". But the Deacon said to him, "Since you have not yet been given Holy Baptism, you must go out of the Church". To this Cyprian replied, "As Christ my God liveth, Who has delivered me from the devil, Who has preserved the maiden Justina pure, and has had mercy on me - you will not chase me out of Church until I have become a complete Christian". Finding out about this, St. Justina gave thanks to God, distributed much alms to the poor, and made an offering in Church. And Cyprian, on the eighth day after his Baptism, was made a Reader by the Bishop; on the twentieth day he was made Subdeacon, and on the thirtieth day a Deacon; and in a year he was ordained Priest. Cyprian completely changed his life; with every day he increased his struggles, and constantly weeping over his previous evil deeds, he perfected himself and ascended from virtue to virtue. Soon he was made Bishop, and in this rank he led such a holy life that he equalled many great Saints. At the same time he zealously took care of the flock of Christ which had been entrusted to him. St. Justina the maiden he made a Deaconess, and then entrusted to her a convent, making her Abbess over other Christian maidens. By his conduct and instruction he converted many pagans and acquired them for the Church of Christ. Thus, idol worship began to die out in that land, and the glory of Christ increased. Seeing the strict life of St. Cyprian, his concern for the Faith of Christ, and for the salvation of human souls, the devil ground his teeth against him and inspired the pagans to slander him before the governor of the eastern region, saying that he had put the gods to shame, had converted many people away from them, and was glorifying Christ, Who was hostile to their gods. And so, many impious ones came to the governor Eutolmios, who was then governing those regions, and made slanders against Cyprian and Justina, accusing them of being hostile to their gods and to the emperor and to all authorities, saying that they were disturbing the people, deceiving them, and leading them in their footsteps, disposing them to worship the crucified Christ. At the same time they asked the governor to give Cyprian and Justina over to death for this. 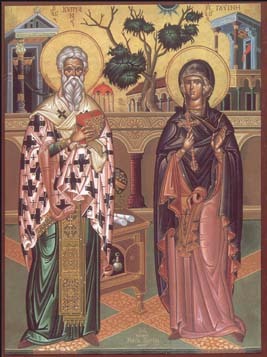 Having heard their request, Eutolmios commanded that Cyprian and Justina be seized and placed in prison. Then, setting out for Damascus, he took them with him in order to make judgment upon them. And when they had brought the prisoners of Christ, Cyprian and Justina, to him, he asked Cyprian, "Why have you changed your earlier glorious way of life, when you were a renowned servant of the gods and brought many people to them?" St. Cyprian related to the governor how he had found out the infirmity and the deception of the demons and come to understand the power of Christ, which the demons feared and before which they trembled, disappearing from before the sign of the precious Cross; and likewise he explained the reason for his conversion to Christ, for Whom he declared his readiness to die. The torturer did not accept the words of Cyprian in his heart but being unable to reply to them, he commanded that the Saint be hung up and his body scraped, and that St. Justina be beaten on the mouth and eyes. For the whole time of the long torments they ceaselessly confessed Christ and endured everything with thanksgiving. Then the torturer imprisoned them and strove by kind exhortations to return them to idol worship. When he was unable to convince them, he commanded that they be thrown into a cauldron; but the boiling cauldron did not cause them any harm, and they glorified God as if they were in some cool place. Seeing this, one priest of the idols, by name Athanasios, said, "In the name of the god Aesculapios, I also will throw myself into this fire and put to shame those sorcerers". But hardly had the fire touched him than he immediately died. Seeing this, the torturer became frightened, and not desiring to judge them further, he sent the Martyrs to the governor Claudios in Nicomedia, describing all that had happened to them. This governor condemned them to be beheaded with the sword. When they were brought to the place of execution, Cyprian asked for a little time for prayer, so that Justina might be executed first; he feared that Justina would become frightened at the sight of his death. But she joyfully bent her head under the sword and departed unto her Bridegroom Christ. Seeing the innocent death of these Martyrs, a certain Theoktistos, who was present there, greatly pitied them, and, being inflamed in his heart toward God, he fell down to St. Cyprian and, kissing him, declared himself a Christian. Together with Cyprian he also was immediately condemned to be beheaded. Thus they gave over their souls into the hands of God; their bodies, however, lay for six days unburied. Certain of the strangers who were there secretly took them and brought them to Rome, where they gave them to a certain virtuous and holy woman whose name was Rufina, a relative of Claudius Caesar. She buried with honour the bodies of the Holy Martyrs of Christ: Cyprian, Justina, and Theoktistos. At their graves many healings occurred for those who came to them with faith. may the Lord Jesus Christ heal also our afflictions of body and soul. Thou hast purified thyself by the ways of repentance, and with the streams of thy blood, thou hast drowned the enemy; and now thou dost reside with the Holy Justina in the mansions of Paradise. O Hierarch Cyprian, ever guard thy monastery from the wiles of the enemy.